Headboards have been known to be strictly a functional piece for any bedroom, usually it is used to keep pillows and linens in place but with changing time it has become a stylish element to the bedroom. If you feel your bed has become boring, try these cute DIY headboard ideas from Beautiful Homes and Gardens to add a refreshing look to your bedroom, they are easy to make and add to the style of the room. Simple square shape makes the upholstery job easy, a simple paint or print pattern in color theme matching with the room makes it a part of the whole theme instantly. With simple craft supplies you can make a headboard which gives a feeling of classic wrought iron bed, you will enjoy if you like drawing and crafting. 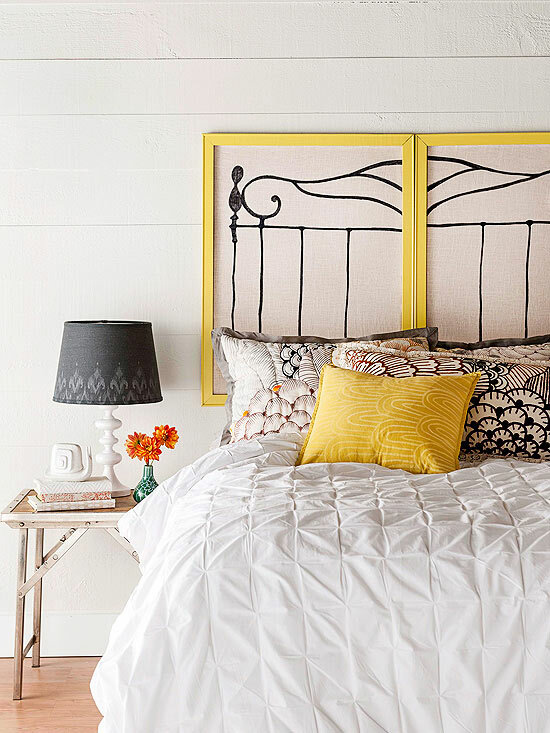 Click here to learn how to make this headboard in easy steps. Experiment with the material you are planning to use for headboard, using tin ceiling tiles is an innovative way to make this beautiful headboard. You can easily paint them in the color matching your rooms color theme. Not interested in painting or putting much time in making a headboard, here is the simplest idea for a colorful and creative headboard. Simply drape a length of fabric and clip both the sides together with curtain rings or loop ribbon. 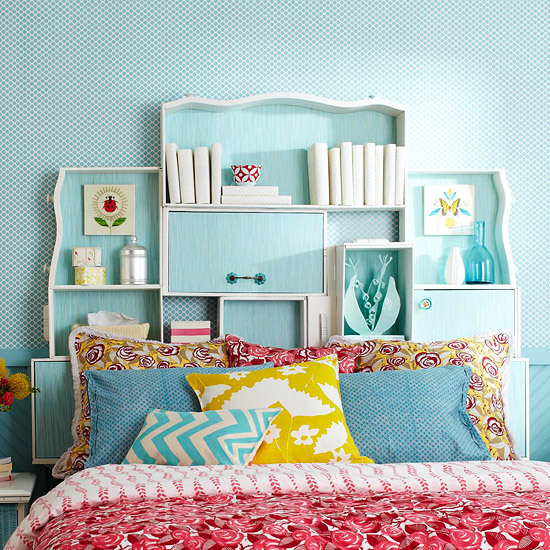 Instead of constructing a headboard, make it a easy task, paint it. 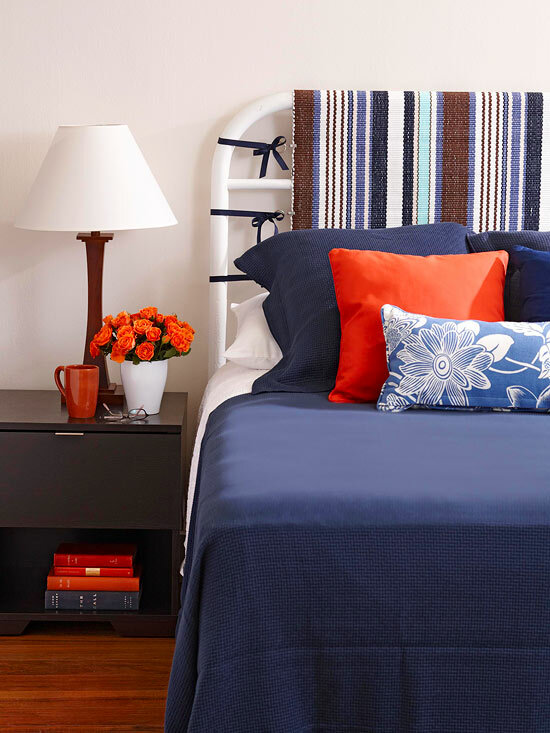 Though you would need to good painting skills and supplies but this project will add a beautiful and colorful style statement to your bedroom. Built – in storage along with a headboard is a smart way to use the space and add to the overall look. Using old drawers and combining them together will help you create a open storage and display area plus its has a great functionality as well. 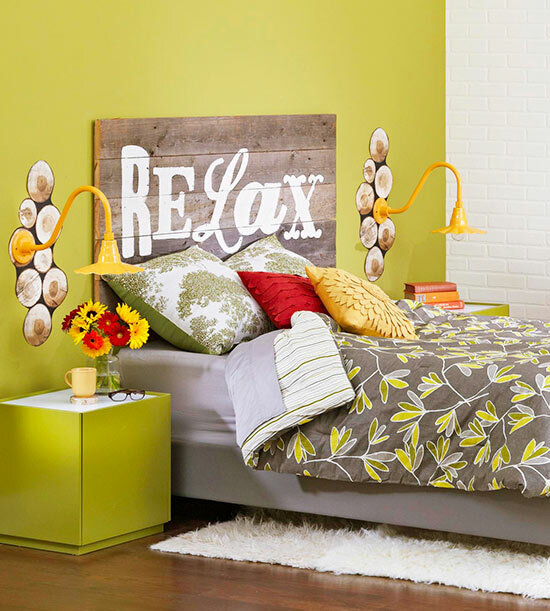 Frame it, add a burst of color with framed headboard. Stretch fabric over heavy cardboard and secure with inexpensive with poster frames in coordinating color. 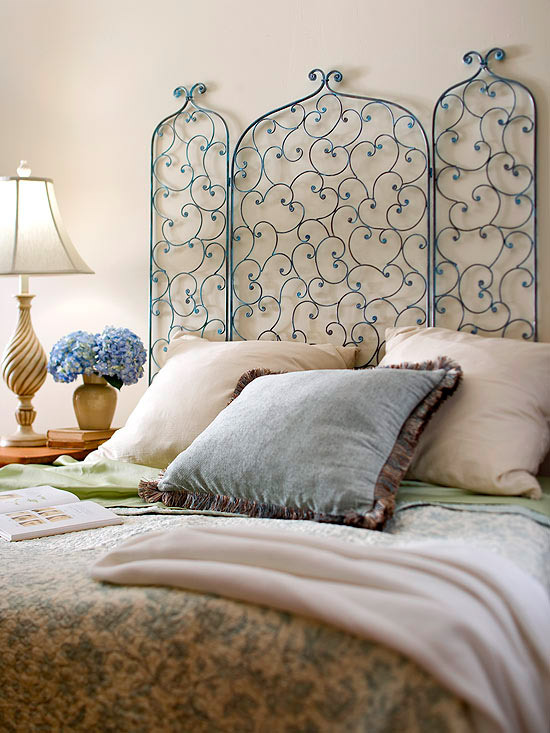 Wrought Iron furniture can be used to achieve a antique look easily, instead of buying a wrought iron headboard you can unfold a fireplace screen and hang it as headboard. You can paint it in the the desired color easily. 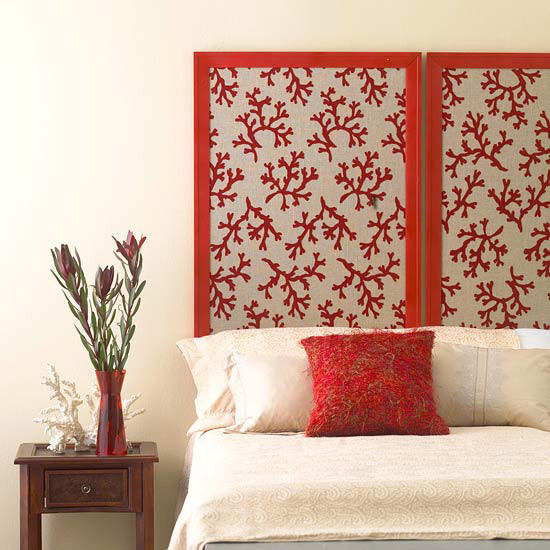 Another great idea of DIY headboard, two single window panels without glass and with thin plywood decorated with fabric or wallpaper. Best part is you don’t have to do much to achieve the desired rustic look.